Cyclades is the famous island group in Greece located in the central and southern part of the Aegean Sea. The cyclades islands consists of 39 islands of which only 24 are inhabited, characterized by their unspoiled beauty and traditional character. They were part of the cradle of the first European civilization nearly 5,000 years ago. The islands of Cyclades are like jewels shining under the bright sun. Windmills, countless churches and monasteries perched on the hills, picturesque narrow alleys, endless sandy beaches and isolated coves with crystal clear waters are featured in each and every one of these islands which bear traces of their rich history and tradition. This ramarkable tour of the Cyclades takes us from Piraeus to the island of Kythnos. 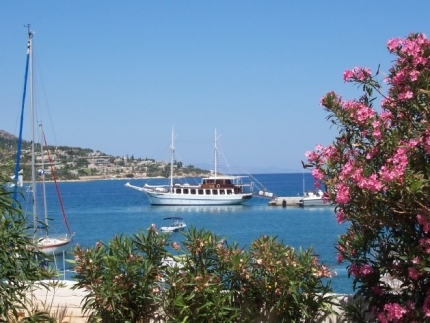 This is the starting point for hopping around the heart of the Greek archipelago. It is also here that we see typical Greek beauty: gleaming white cubic houses with blue shutters, and labyrinth lanes giving flavor to the island towns. Enjoy the great weather, dip into the water after your bike ride, and take in the scenery as you sip your ouzo before dinner. It doesn't get any better. Cycle along the ragged coastlines, with the clear turquoise-blue sea and fantastic sand beaches beside you... Greece has it all, history, culture, delectable seafood, friendly people and to make your holiday in Greece perfect.